DO YOU HAVE TO BE SELF CONFIDENT TO BE A BLOGGER? I think it's fair to say there are a lot of presumptions and myths about bloggers that get said, not only in the blogosphere, but in real life, too. I'm sure I'm not the only one who has heard a colleague or a family member scoff at how all bloggers do is take selfies and get sent free stuff, right? But something else I think a lot of people believe about bloggers is that we're all total narcissists who just LOVE taking selfies all. day. long. Of course this might be true for a few of us, which might not even be a bad thing, but for me, this is definitely not the case, so I want to ask, do you have to have self confidence to be a blogger? A lot of the time, blogging involves taking pictures of yourself or getting photos taken of you. I guess if you don't really know much about blogging except for glimpses you see on Instagram, you could be forgiven for thinking that all bloggers are vain. After all, who else takes pictures of themselves every day of the week? But for me, and a lot of other bloggers I know, this is definitely not as it seems. I have touched on my body image story a long time ago, and my self hang-ups still stand. I still haven't got my nose fixed (needle phobia) and I'm not exactly over the moon with my weight, but I try not to let these issues hold me back from doing what I love, which is creating content. Of course this is a lot easier than it sounds, and is certainly not the case for everyone. It's never straight forward. Years ago, I used to get upset if I saw my crooked nose or chubby arms in a picture, but after 6 years of blogging and literally thousands of photos, I find it easier to move on and just try again. Since I started blogging, I've become much more confident when getting my photo taken, and know that if a less than flattering photo ends up online, it's not the end of the world. In a way, I suppose my blog gives me control over my image, in an "ideal self" way and "real self" way too. Okay, getting philosophical here..
- step out of your comfort zone now and again. You'll look back and think "well if I did that, I can manage this"
- be kind to yourself. I heard some great advice lately that I'll remember forever. It is "treat yourself like you treat your best friend"
I would count myself quite lucky, because I've found the source of my confidence, and not a lot of people do that so early on in life. For me, I get my confidence from my clothes. A few years back, I used to dress fairly quirky and wouldn't be so afraid to wear things that others might. I knew people might look at me, but they were really looking at the clothes, not my bad skin or crooked nose. Just like how some people often refer to makeup as a mask, my outfits are kind of my armour in a way, something I use to give me confidence, or even a spring in my step. Do you know what I mean? When I got this gorgeous Women's Lingerie set from Beija London in the post, I dabbled with the idea of trying them on and posing for the camera. I knew I wouldn't be confident enough to stand in front of the camera wearing nothing but my underwear, but maybe with a jumper strewn over one shoulder and a blanket in the mix, I could do it. But when it came down to it, I couldn't do it. I'm not ready. I'm self conscious about my stomach (why oh why can my chub not go to my bum?) and my eczema. 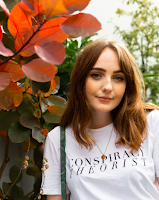 That's why I've opted for a flat lay, because, it turns out, you do not have to have tip top levels of self confidence to be a blogger, but you do have to believe in yourself. It's a tough industry, but with a little self belief and a new set of underwear to make you feel put together, you can do it. Take a look at Beija London for a range of lingerie and swimwear with a sizing system with a twist and feel your best, sassy self. What do you think on this topic? Do you think it takes self confidence to be a blogger? And is that confidence in how you look or confidence in who you are, or a bit of both? If you have any confidence boosting tips, make sure to leave them in the comments below to help each other! *Items marked with (*) are gifted. All opinions are my own. I loved this post and totally agree! After 5 years of blogging, taking pictures just feels like another hobby and I never even think of it as sharing pictures of myself, if that makes sense? I don't post them to be like 'everyone look at me' it's because it's my blog, my style and thats content I want to show off! I love all the tips and definitely agree with being kind to yourself, love yourself and then everyone else will love you!